Isaac Bashevis Singer and Sholem Aleichem gave us delightful fables about the shtetl, the overcrowded villages of Eastern Europe, with endearing characters that contended with abysmal poverty, deadly pogroms and false messiahs. However, life in the shtetl was not always so dreary. 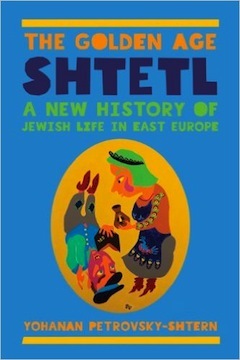 In a new book that effectively undermines the archetypical shtetls of our imagination, Yohanan Petrovsky-Shtern in The Golden Age Shtetl: A New History of Jewish Life in East Europe (Princeton University Press) redraws the image of the shtetl. A professor of Jewish studies at Northwestern University and author of several books, Petrovsky-Shtern documents a brief period in history, from the late 17th century to the mid-18th century, when life was not so bad in those towns of our ancestors in eastern Poland and Ukraine. Petrovsky-Shtern looks closely at three provinces with 44 shtetls in Eastern Europe. Relying mostly on documents that were previously overlooked, he discovers that many of the shtetls at that time were neither poor nor especially pious. On the contrary, they were thriving communities with stable economies built around popular market fairs. Some shtetls had trading firms that rivaled those found in large cities. Some had fancy restaurants and a rich cultural life. Although Jewish businessmen were prominent, the Jews were a minority in many of the towns. Jews and Christians lived and worked together. As might be expected in any neighborhood, the Jewish community also had its share of characters of questionable integrity. Petrovsky-Shtern goes through historic court records that reveal stories of bribes, counterfeiting, smuggling, informants and collusion of Jewish businessmen with crooked clerks. Even the rabbinical leadership comes under his microscope. Jews came to Eastern Europe with the Greek colonizers more than 2,000 years ago but the Jewish presence in the region was minimal until Polish nobility encouraged Jewish migration from Western Europe. The Jews were invited to run country fairs and sell liquor, two activities that provided significant tax revenues to the Polish authorities. The Jewish businessmen brought new “Western” approaches to trade. They put stores and stalls under one roof, and sold exotic merchandise from distant lands. They opened inns offering a place to drink and a bed. They injected a cosmopolitan slice of urban life into rural agricultural areas. They expanded trade, bringing prosperity to the region. By 1840, however, the golden era had started to fade. The Russian monarchy, which had ruled the region with benign neglect since the partition of Poland in the late 1700s, began asserting its authority. Discriminatory laws against Jews contributed to the decline of the shtetl, as authorities shifted economic and political power to larger urban centres. Once-vibrant communities turned into depressed outposts of the Russian Empire, the shtetl of popular Yiddish literature. They struggled to survive in their diminished state, until the Nazi regime wiped them out. A fascinating and often ignored aspect of the shtetl described by Petrovsky-Shtern is the relationship of the shtetl Jews with the Holy Land. In the late 18th century, about 500 Jews from the Polish-Lithuanian Commonwealth went to Palestine to build a religious utopian community. Followers of Rabbi Eliyahu ben Zalman, the Mitnagdim idealists, were convinced that resettlement would pave the way for the Messiah. The rabbi, also known as the Vilna Gaon, had predicted the Messiah would arrive in 1840, coinciding with the year 5600 in the Jewish calendar. Not to be undone, followers of the Ba’al Shem Tov, the rival Chassidic sect, made aliyah in even greater numbers, settling in Safed, Tiberias, Hebron and Jerusalem. By 1800, the Jewish population of Palestine had expanded to 6,000, accounting for roughly two percent of the population. Petrovsky-Shtern recounts the impact of this aliyah on those who remained behind in the shtetl. In some respects, reverberations of the migration continue to be felt almost 200 years later. The pioneers in Palestine faced unimaginable challenges: poverty, illnesses, natural disasters, famine and discriminatory Ottoman Empire laws. In order to survive, the Jews of Palestine developed a sophisticated network of rabbinic fundraisers who went from shtetl to shtetl, giving sermons, selling books and sparking the imagination with stories about the Holy Land, including tales about inscriptions on the tombs of the prophets. Jacob, Sarah, Rebecca and Leah. The authorities tried to stop the flow of funds to Palestine. They suspected that the Jews, who they blamed for the death of Jesus, were sending money to rebuild the Temple in Jerusalem. They believed that the fundraising was reinforcing Jewish separateness, undermining assimilation, increasing fanaticism and possibly hindering Jews’ ability to pay local taxes. Also, as the years passed, raising funds for the Jews in Palestine was viewed as aiding an enemy of the state. By the 1800s, the Polish-Lithuanian Commonwealth had been partitioned and territory that included many of the shtetls became part of the Russian Empire, which had hostile relations with the Ottoman rulers. Yet, Jewish communities still managed to raise money, especially in the years from 1810 to 1830. Aiding the Jews of Palestine became one of the highest priorities for Eastern Europe’s Jews, comparable only to the commandment of ransoming prisoners, Petrovsky-Shtern says. The communal leadership of dozens of shtetls in the provinces of Volhynia and Podolia imposed a tax to help establish a synagogue in Jerusalem and maintain Chassidic groups. Charity boxes were on many dining tables and store counters. As well, sacks of earth from the Holy Land and ritual objects produced by the Jews of Palestine found their way into everyday life of the shtetl. Unpublished manuscripts by Holy Land rabbis and mystics were much sought-after reading, passing from hand-to-hand in the shtetl. In a tale that echoes across two centuries, Petrovsky-Shtern recounts the role of the legendary charity boxes that are now found in many Jewish homes in North America. He writes that Jewish women in the shtetl of Kremenets, and possibly surrounding towns, turned the “commandment” to help the Jews of Palestine into an intrinsic part of the blessings over candles before Shabbat: right before the blessing, they put some money aside in a wooden charity box or tin mug to support the Holy Land communities. By the time of the devastating earthquake in Safed in 1837, whatever hurt Palestine was felt just as strongly in the shtetls of Eastern Europe. The relationship between the shtetl and the Jews of Palestine appears to have many similarities with contemporary links between Israel and the Diaspora. Petrovsky-Shtern provides a wealth of information about many different aspects of daily life, woven between lively vignettes to illustrate the comfortable standard of living enjoyed by many shtetls before their precipitous disintegration. Unfortunately, the book is too easy to put down. Petrovsky-Shtern’s encyclopedic descriptions of the shtetl provide solid background for an academic understanding of the shtetl, but the pace is uneven. Interesting stories, such as the account of the relationship to the Holy Land, are interspersed with lengthy reports of dry historical records. As Petrovsky-Shtern wanders back and forth across the years and jumps from shtetl to shtetl, the locations and dates turn into boring lengthy lists of trivia. Despite the endless string of names of real people, the reader does not come to know anyone in the shtetl. The facts may be on Petrovsky-Shtern’s side, but Isaac Bashevis Singer and Sholem Aleichem tell much more memorable stories. Robert Matas, a Vancouver-based writer, is a former journalist with the Globe and Mail. This review was originally published on the Isaac Waldman Jewish Public Library website and is reprinted here with permission. To reserve this book or any other, call 604-257-5181 or email [email protected]. To view the catalogue, visit jccgv.com and click on Isaac Waldman library.